Leading Wholesale Trader of beaded ladies carry bag, hand embroidery handbag, beaded and embroidery handbags, zari handmade beaded clutch purse, beaded clutch purse and bridal beaded clutch purse for festive party from Agra. We are manufacturer and exporter of Hand Embroidery Handbag. We have huge collection to offer in this catageory. We can customized according to buyers requirements. 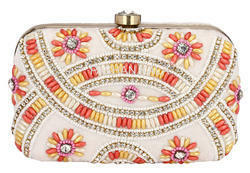 We are manufacturers and exporters of Beaded Clutch Purse for Evening Party based in Agra. We have many styles and designs to offer in this category. We can make customized hand bags also. We are offering Designer Bridal Beaded Clutch Purse for Festive Party to our clients. Our range of Designer Hand Bag is widely appreciated by our clients which are situated all round the nation. We offer our range of Designer Hand Bag at most affordable prices. We are manufacturer and exporter of high designed Ladies Beaded Clutch Purse. We have many styles of fashion hand bags as well to offer. We can develop any style according to buyers requirements. 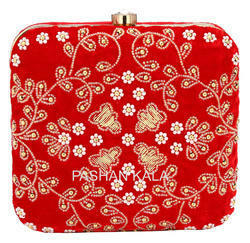 Looking for Zari Hand Embroidery Purses ?